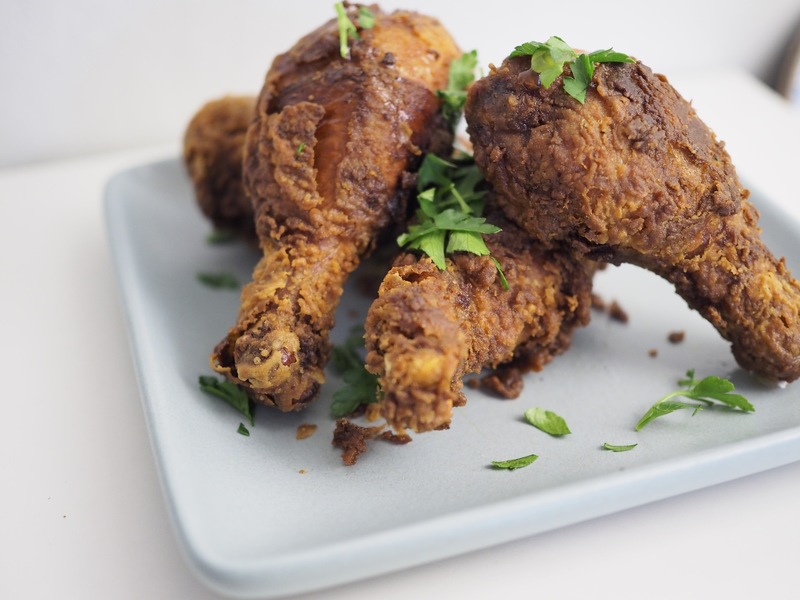 Skillet Fried Buttermilk Chicken — Oh Wonderful! Man, I love fried chicken. I mean, who doesn’t? Remember when I was “gluten-free” last week? Well, I’m super glad that’s over because I went H.A.M. on some burgers, pizza, and fried chicken this weekend. Since I have been craving fried chicken so much, I figured I should probably make my own so I could eat fried chicken at my leisure – which means in bed, with leggings on, and Netflix bumping. To whip this up, I used my beloved Lodge skillet for that hot, cast iron deliciousness. Give yourself a day in advance to prep everything, that way, you can simply heat the oil then drop in the chicken before chowing down. 1. The night before you plan on making fried chicken, mix the salt, black pepper, and chili powder together and generously coat the chicken. Cover and refrigerate overnight. 2. In a separate bowl, combine your buttermilk and rosemary sprigs and soak overnight. 3. Once you’re ready to fry your chicken, fill your skillet (it can not be non-stick!) with oil so that it’s about 3/4 inches high and reaches 350 degrees Fahrenheit. 4. In a bowl, mix your flour, baking soda, salt, and cracked black pepper and discard the rosemary sprigs from your bowl of buttermilk. Dip your chicken in the rosemary buttermilk first, shake off the excess, then coat generously with the flour mixture. 5. Drop your chicken in, but don’t fill your pan with more than three pieces at a time, otherwise you’ll bring the oil temperature down too much. Cook your chicken for about 10 minutes or until the inside temperature at the thickest portion reaches 165 degrees Fahrenheit. Once the chicken is fried to perfection, place on a slotted rack to degrease and cool down. 6. Serve with drizzled honey, hot sauce, or whatever you like! Enjoy! Pingback: Steak & Fried Chicken Tacos with Fresh Guacamole – Oh Wonderful!